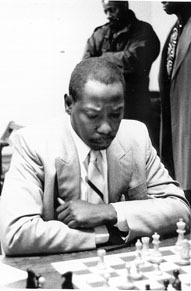 This first game in the "Fire on Board" segment is dedicated to the memory of NM Wilbert Paige (above), a national master from Philadelphia, Pennsylvania who was a perennial participant in World Open tournaments. Paige, a likeable person, passed in April 1996, and his last published rating was 2268. Wilbert once told me that NM Walter Harris, the first Black master in the U.S., was featured in an encyclopedia around 1960. The following game took place at the 1993 World Open where Paige upends IM Ed Formanek uncorking a brilliant, intuitive Queen sac. He then finishes the game with a devastating mating attack! Enjoy!